← Understanding Flying Corvairs Pt. #1, Intro. If you have not seen the Intro to this series, you can read it here: Understanding Flying Corvairs Pt. #1, Intro., It will explain the goals of the articles. Please take a moment to read it, including the comments section. What is the hardest working flying Corvair engine? Without question, The 3,000 cc Corvair in Dan Weseman’s Panther is worked harder than any other flight engine. Engine loads are determined by the RPM, power output, the G-forces applied, the weight of the prop, the density of the air, and how long these loads are sustained. Cooling is affected to a great extent by sustained climb speeds; the lower the speed the plane can climb at, the better the cooling needs to be. Seen as a composite of all of these factors, no other Corvair comes close; The flight rpm is well over 3,000, It is a high compression 120hp engine, the plane is regularly flown to it’s full 6.6 G rating pulling thousands of aerobatic maneuvers in it’s first 100 hours. It has a medium weight prop and is mostly flown in dense sea level air which increases the output. I have personally seen Dan take off for a flight and lock the throttle wide open for 28 minutes. The engine is never babied, and almost all of its tight maneuvering against other aircraft are done at full power and low airspeeds to take advantage of the plane’s aspect ratio which reduces induced drag in high G turns. If you have not seen Dan fly the plane in person, it is very hard to visualize how extreme his use of the engine is. The video links below give some idea, but to really understand, you have to see it in person. The Panther’s engine has a Weseman billet crank in it, but I will also point out that Dan also built and flew ‘The Wicked Cleanex’ several hundred hours on a 3,100 cc Corvair with GM 8409 crank. He flew that plane nearly as hard as the Panther. It’s engine had an additional 100cc, turned more rpm, and flew many of the same maneuvers, also at slower climb speeds. Between the Panther and the Cleanex, Dan has flown about 500 hours, but he has also flown 9 other Corvair powered planes for comparison. Builders have a perception of what the engine can and can’t do, and how they will configure it partially based on what they believe the engine is proven to do. An extreme example of this is a local guy who has seen one Corvair in a 1970’s Pietenpol assuming that is all that the engine can do. But even in the information age, most builders can not correctly identify Dan’s Panther engine as the hardest working engine. Builders look at other installations and make decisions based on the perception that those engines are working very hard. This has two pitfalls: If the engine they assume it working hard really isn’t they falsely conclude they can copy those systems and components into their plane. It also works the other way, and they can falsely conclude that a Corvair will not work in an application because the engine they are looking at has problems. Most often the issues are not generated because the ultimate potential of the Corvair has been met, the issues are caused by choices the builder made. In many case the Panther engine could be transferred to the application in question, and it would work flawlessly. Correctly identifying the Panther’s engine as the hardest working engine allows builders to make better, more informed choices. Many builders think that Mark Langford’s 3,100cc Corvair that was in his KR-2s must have been the hardest driven engine. I know both planes and pilots well, and I want builders to understand that Mark’s goal was mostly efficiency. He did impressive things like getting 150mph at 3 gallons per hour. But that is done at altitude, and it isn’t a very heavy load. A KR can not sustain the G loads that a Panther of Cleanex can, and Mark is not the aggressive aerobatic pilot that Dan is. The KR climbs at a much higher airspeed and requires less power to fly at any airspeed over 120mph. In short, It’s engine is not working nearly as hard. Here are two examples why this matters: Frequently builders say to me “I want to use fiberglass plenum cooling on my plane because it worked on Mark’s plane, and it was the most powerful Corvair”. This is a false conclusion. If you put Mark’s cooling ducts on the Panther and flew it the way Dan does, it would overheat. The ducts work on a KR because of it’s higher airspeeds and the fact the plane can not be flown as aggressively or under high loads. A KR builder could use ducts, but we also make a standard Cowl and JSWeseman.com has a baffle kit for it. It is the same type of cooling as the Panther and the Cleanex have. 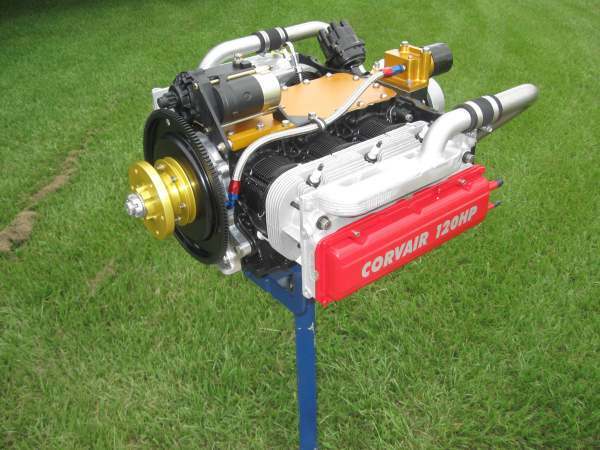 The second false perception is when a guy wants to build a 120hp Corvair, but concludes that it can not be done, because Mark had issues, and the builder perceives that these were caused by the engine reaching it’s output limit. Because I know the Panther engine is actually driven harder, that it’s engine, complete with front starter and cooling could be installed in a KR and it would work without issue. I know this because it has been done already by well know KR builders like Steve Makish and Dan Heath. The systems we sell and promote work, and they have proven to do so in the most demanding applications. This is easier to see if one understand what the most demanding application actually is. Neither the Panther nor the Cleanex have had significant issues. The engines work and run, period, they both run cool, and neither one has had a single inflight issue. -ww. The Panther’s engine, worlds strongest Corvair flight engine. Why Not the Panther engine? 3,000 vs 3,100 cc Corvair engines. Above, the engine is a 3,000 cc engine with a Weseman bearing, Falcon heads and all of our Gold System Parts. In the foreground above is Dan Weseman’s Wicked Cleanex. Off his wing, Chris Smith flies the Son Of Cleanex. The photo was taken over a bend in the St. Johns River in North Florida. Today the wicked cleanex is owned and flown by Chuck Gauthier on the west coast. The plane has about 450 hours on it, without issue.